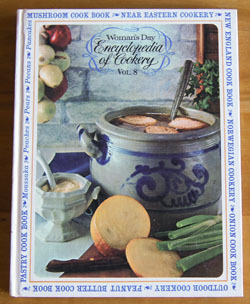 Cookbook #174: Encyclopedia of Cookery, Vol. 8, Moi-Pec, Woman’s Day, Fawcett Publications, NY, 1966. I have a set of twelve Encyclopedia of Cookery volumes and this is the eighth of that set – I covered the first seven in previous posts. I’ve enjoyed all of them so far! This volume covers curious and helpful information about foods from moi(sten) to pec(an). But in Costa Rica, that sugar cane juice became moonshine! 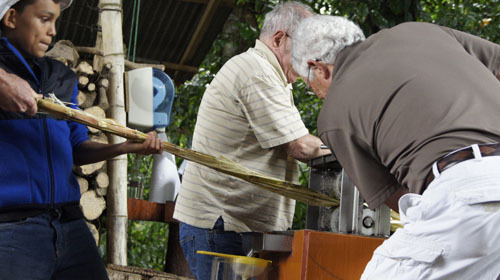 To make molasses, the cane juice is boiled down to a thick mass of syrup and crystals of sugar. Next, the brew is strained to isolate solid sugar crystals and syrupy liquid. The syrup from this first boiling process is sold as “light molasses”. “Dark molasses” results from a second boiling/straining of the syrup and “blackstrap molasses” results from a third boiling/straining. Light molasses can be used as a syrup on pancakes; dark molasses is less sweet (and darker in color) and is used in baking and candy making. Blackstrap molasses is generally used as cattle food – or as a health food. Molasses was the most widely used sweetener in America until the Civil War. The Near Eastern Cookery section brings back memories of our trip to Turkey. Nesselrode? I remember it from childhood, but I think it was an ice cream. Perhaps it was: I learn that “nesselrode” refers to an iced pudding made from egg yolks, sugar, cream, chestnuts, orange peel, currants, and candied cherries. The article “New England: Character and Cookery” was written by Louise Dickinson Rich. I find a recipe in this section for muffins using molasses called “Anthelias’ Sour-milk Gingerbread Cupcakes”. Could make those. Still, I search on for a recipe to make for this blog. “Noodle” derives from words meaning “food paste”. In “Norwegian Cookery”, I find recipes for marzipan (from almonds, sugar, and egg whites), Puss Pass (a lamb stew), and cold cherry soup, made from fresh cherries (including ground pits), sugar, water, and lots of sherry. Nutmeg, nutrition (interesting to read a 1966 view of this topic), and oatmeal. Oleomargarine was first prepared in 1870 by a French Chemist, Mège-Mouriès from beef oil, milk, and water, with annatto for coloring. Oleo derives from “elo” (oil) and margaric acid (an animal fat). Annatto seeds are used today in anchiote paste, a deep red seasoning from Mexico. Olive oil should be “golden or straw yellow”, and “greenish oils are inferior”. My staple, green extra virgin olive oil, is not even mentioned! Next, oranges and oregano. An essay on “Outdoor Cooking” by Craig Claiborne and one on “The Delectable Oyster” by James Beard. Pancakes are the oldest form of bread and are made around the world. Oriental versions of pancakes have been made for “untold Oriental ages”. Next, pasties (meat pies) and a Pastry Cook Book. “Patty” is a “small, round, flat mass of food dough, cereal, potato, or other vegetable, ground meat fish, poultry, or nuts”. Hmmmm. 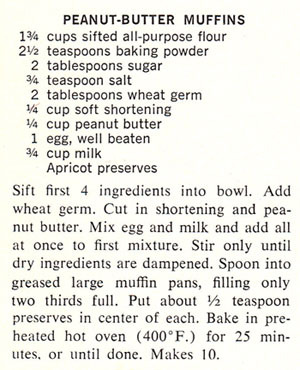 Peas, a Peach Cook Book, peacock (yes, people eat them), peanuts, peanut butter – Peanut Butter Muffins! Pears and pecans finish off this volume. I want to make Peanut Butter Muffins. I haven’t made muffins with peanut butter in them for years! I decide to leave the jam out of the muffins, add a bit more sugar, and combine the wet ingredients with a mixer, but otherwise will follow the recipe. Stir together the flour, baking powder, sugar, salt, and wheat germ. Set aside. Using a mixer, beat the egg. Mix in the shortening, then the peanut butter, then the milk. Stir in the dry ingredients only until the mixture is moistened. Fill 10 mufffin cups (each should be 2/3 full). Bake at 400˚ for 20-22 minutes. These tasted very peanut buttery, but were a little dry. With a lot of jam on them, I really enjoyed them. But looking at the original recipe, these are more like scones: the shortening and the peanut butter probably should be “cut in” with a pastry blender. I was reluctant to do this because it would be so messy! But mixed as in the original recipe, these might have been sort of flaky, like pie crust or scones. 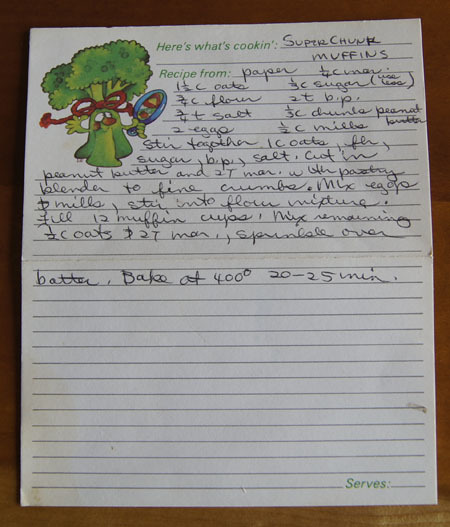 I found my old recipe for “Super Chunk Muffins” in my index card recipe file. I’ll make them soon and let you know if I like them better. This old recipe also calls for using a pastry blender to cut in the butter and peanut butter. Stir together the oatmeal, flour, sugar baking powder, and salt. Cut in the peanut butter and margarine with a pastry blender to fine crumbs. Mix the eggs and milk, stir into flour mixture. Fill 12 muffin cups. Optional: mix 1/2 cup oatmeal and 2 tablespoons butter and sprinkle over the batter. Bake at 400˚ for 20-25 minutes. This entry was posted in 250 Cookbooks, Muffins by admin. Bookmark the permalink.